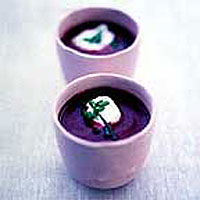 There's no potato in this soup because the beetroot performs the thickening function on its own. Add the beetroot to the onions with the stock. Season, then purée. Reheat, adding more stock or milk if you like, and adjust the seasoning. This recipe was first published in Mon Jul 01 01:00:00 BST 2002.